Product prices and availability are accurate as of 2019-04-23 09:45:07 EDT and are subject to change. Any price and availability information displayed on http://www.amazon.com/ at the time of purchase will apply to the purchase of this product. Master Deep Learning & Leverage Business Analytics – the Easy Way! Deep Learning for Business With R takes you on a gentle, fun and unhurried journey to building your own deep neural network models for business use in R. Using plain language, it offers an intuitive, practical, non-mathematical, easy to follow guide to the most successful ideas, outstanding techniques and usable solutions available using R.
BUSINESS ANALYTICS FAST! 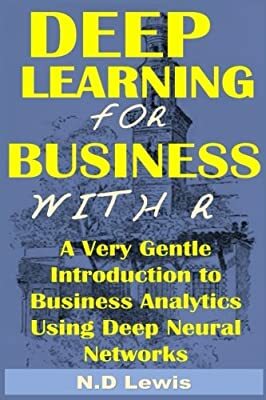 This book is an ideal introduction to deep learning for business analytics. It is designed to be accessible. It will teach you, in simple and easy-to-understand terms, how to take advantage of deep learning to enhance business outcomes. NO EXPERIENCE REQUIRED I’m assuming you never did like linear algebra, don’t want to see things derived, dislike complicated computer code, and you’re here because you want to see how to use deep neural networks for business problems explained in plain language, and try them out for yourself. Real world applications that make sense. Illustrations to deepen your understanding. Worked examples in R you can easily follow and immediately implement. Ideas you can actually use and try on your own data. QUICK AND EASY: Deep Learning is little more than using straight-forward steps to process data into actionable insight. And in Deep Learning for Business with R, author Dr. N.D Lewis will show you how that's done. It's easier than you think. Through a simple to follow process you will learn how to build deep neural network models for business problems in R. Once you have mastered the process, it will be easy for you to translate your knowledge into your own powerful business applications. TAKE THE SHORTCUT: R is easy to use, available on all major operating systems and free! Each chapter covers, step by step, a different aspect of deep neural networks. You get your hands dirty as you work through some challenging real world business issues. Unleash the power of Deep Neural Networks for classifying the popularity of online news stories.. Develop hands on solutions for assessing customer churn..
Design successful applications for modeling customer brand choice. Master techniques for efficient product demand forecasting. Deploy deep neural networks to predict credit card expenditure. Adopt winning solutions to forecast the value of automobiles. If you want to accelerate your progress and act on what you have learned, this book is the place to get started. 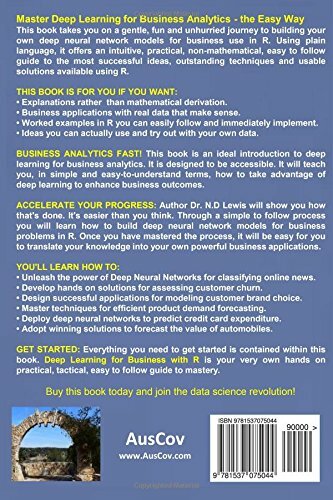 It reveals how deep neural networks work, and takes you under the hood with an easy to follow process showing you how to build them faster than you imagined possible using the powerful and free R programming language. Buy this book today your next big breakthrough using deep neural networks is only a page away!